Dianyu Zhao is a highly regarded artist at the national level who specializes in painting nature, particularly flowers and birds. He is known as a student of "Qi's Lineage" as he studied under the guidance of Qi, Liangchi, a son of Qi, Baishi, one of the two most famous painters in modern Chinese art history. This exhibition, presented in the Fred S. and Ogden Martin Concourse Gallery, is a collaboration between the Great Enlightenment Buddhist Institute Society and the Confederation Centre Art Gallery. Dianyu Zhao was born in 1943 in Rushan, Shandong Province, China. He is recognized as one of China’s preeminent artists. 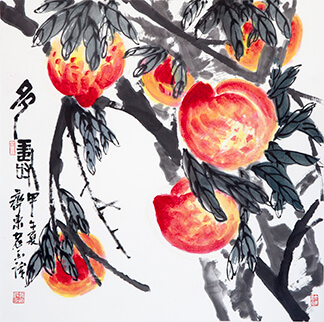 Having studied painting since childhood, Zhao became famous for his spontaneous freehand brushwork of flowers and birds. His work embodies the innate character of traditional Chinese paintings. Zhao’s painting technique is governed by classic theories, which he innovates upon using his own personal touch. His brush strokes and ink colors are intriguing, stimulating, unrestrained, and highly personalized. In addition to his artistic practice, he is a member of the Shandong Province Artists Association, a senior artist at the Shandong Art Institute, and a respected professor. Zhao has participated in exhibitions in France, Hong Kong, Japan, Singapore, and South Korea. Many of his works have been collected by domestic and foreign institutions as well as private collectors.